Dragons: Title Uprising is the newest title in Puzzle RPG genre that challenges you to build a strong team of dragons. You will train them, increase their level, and enhance the overall team power to strike down wild dragons on various Islands. The battle mechanics are quite similar to other Puzzle RPGs, but the unique feature it has is breeding. The player can breed dragons together to produce offsprings or discover crossbreeds. The breedery function unlocks at level 16. If you have just started playing it or looking for a guide, some tips before you dive deep into the game, then our today’s Dragons: Titan Uprising guide and Dragons: Titan Uprising tips, cheats & strategies will help you in dominating the battles. ⇒The five main in-game currencies in Dragons: Titan Uprising game are eggs, gold coins, fish, scales, and the runes. You need eggs to hatch dragons from hatchery, gold coins to start hatching/upgrade buildings, fish to level up dragons, scales to train the dragons, and the runes to get dragons from the draft. ⇒There are two ways to attack the wild dragons in the battle; match 3 or more runes on the board or use dragon skills. Before you use the dragon skill, you can lock a specific target by tapping it. After that, your dragon will target the selected enemy. ⇒To use the dragon skill, you must fill the rage bar. At the bottom of the dragon card, the yellow bar indicates the rage required to activate the skill. You can max out it by matching the same color runes/tiles on the board. For example; match the green runes to fill the green dragon’s rage bar. Once maxed out, tap the dragon to unleash its skill. Dragons: Titan Rising game features a wide range of dragons. All the dragons have unique skills, buffs, debuffs, and powerful abilities + all the dragons have different stats; HP, DEF, ATK. You can get dragons from the campaign battles(hit the play button on the screen -> get victory), from the hatchery(tap the egg on the main screen -> start hatching), from the drafts(At the bottom menu options, tap the card button to enter draft screen -> spend runes to get dragons; you get a free dragon every 6 hours). To check the drop rate of dragons, tap on any banner(basic, premium, event -> then tap the (i) icon at the top-right corner). You can produce dragon offsprings in the breedery. Depending on the grade level, a dragon can be trained or developed further with scales. For example; 1-star dragon can be trained only once. So better the grade is, the more you can develop a dragon. In short, we can say that high-grade dragons are good for the long run while 1-star, 2-star dragons can be used as fodder(use low rating dragons to develop high-grade dragons). For example; if you have a bunch of 1-star dragons, you can use them to level up a 3-star, 4-star, 5-star dragon. As mentioned above, all the dragons featured in Dragons: Titan Uprising game have a unique ability. Go to the dragons menu screen -> tap on a dragon and scroll up its profile -> there you can check the dragon abilities. For example; Fireshrike(name of the dragon) has an ability named reassuring presence. Using this ability, this dragon can recover the HP of all allies. remove a debuff, and inflicts bonus damage for a certain number of turns. It would be better to read all the dragons’ skills and use them effectively. You can level up the dragon’s ability by increasing its level. Go to the dragon profile page -> level up -> select the dragons you want to sacrifice to develop the selected dragon -> once selected, above the level up button, you will see the chances of ability level up. Increasing the player level fast is one of the challenges. Because, to upgrade the buildings, you must meet the minimum level requirement. By default, you earn EXP from the campaign battles. But since you can not repeat those campaign battles, it would be better to bet on the event quests and repeatable quests. On the main screen, tap the dragon boat to check available time-limited event quests and repeatable quests. TLE quests last long for a few hours. Keep an eye on these quests and make sure to participate in the EXP farming event to level up fast. Next, scroll down and In the repeatable quests section, you can check the stages that you can repeat over and over again. Spend stamina/energy and keep repeating these repeatable quests. There is a duty or quest in the game; pet dragons. To complete it, go to the dragons menu -> tap on a dragon -> caress/touch the dragon. So that’s all for now as Dragons: Titan Uprising guide. Let’s check out our top Dragons: Titan Uprising tips, cheats & strategies to progress fast and dominate in the battle. 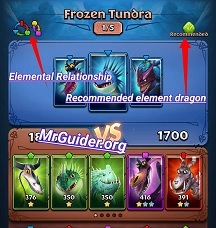 Before you start the battle, on the team editing screen, at the top-right corner, you can check the color of the dragon that is recommended for that specific stage. For example; if it’s green, then make sure to include a couple of green dragons in the squad. How is it calculated? On the basis of the elemental relationship. Check the battle basics guide above for more info. 1-star and 2-stars dragons are not good for the long run and spending in-game items in developing these dragons would be bad. Instead of developing these low -rating dragons, use them in developing 3-stars, 4-stars, and 5-stars grade dragons. The higher the grade is, the more you can power-up a dragon by training. You can get high-grade dragons from the event drafts, premium drafts. Save runes and spend in dragon summons. You should read the dragon skills first in the profile if you want to use it at the right time. For example; dragon’s healing skill when allies are low on health. Additionally, to charge up the skill fast, match the same color tiles. For example; to charge up red dragon skill, match the red tiles on the board. If it’s a damage skill, then make sure to select the enemy first that you want to target. Tap the dragon boat on the main screen of the game -> participate in the daily scale event to earn scales for a specific color dragon. Participate in the time limited event to earn coins, EXP, fish or any other item(these quests last long for a certain period). Keep repeating the repeatable quests to earn eggs, coins, fish, EXP, and dragons. Completing the duties grant a key to the player. Collect 10 keys to get the Viking chest. This chest contains loads of the reward. You can also reroll the duty(once per day) -> tap the reload type icon at the top-right corner of a duty to get another. You can upgrade that building to get more duties. So these are the top basic Dragons: Titan Uprising tips for the beginners. If you have more tips to share with other fellow players, comment below!